News & Events # 43. Dr Deepak Goyal, President of Indian Cartilage Society delivered his Presidential Talk on 28th November, 2015 at Hotel Radisson Blu Ahmedabad during 3rd Congress of Indian Cartilage Society. The title of his talk was “We Have Seen the Future”. This talk was sequential to his last year’s talk when he had talked about “What is the Future of Indian Cartilage Society?”. This year he unveiled his dream Presidential theme called “Preserve The Joints”. He discussed the areas where Indian Cartilage Society (ICS) should concentrate to create awareness amongst medical fraternity and society in general. The two main areas where ICS can play role are; young generation with definitive localized cartilage damage and middle generation with early stages of osteoarthritis. He demonstrated some cases where nearly 2-10 years of successful results have been obtained. A male aged 19 years with a big separated piece of cartilage and bone of a size of big marble, treated well by cartilage repair surgery was shown. He showed how the boy started playing football back because of this joint preservation surgery in less than 2 years time. He also demonstrated a case of 31 year old farmer whose half of the bone had died due to some medication. A joint preservation surgery could regenerate the dead bone and he is back to farming. The joint preservation surgery in this case could save his knee joint from a commonly thought of joint replacement procedure. He also demonstrated a case of 48 year old lady who was having osteoarthritis of half the knee joint. She underwent knee repair in 2005 as part of joint preservation surgery and Dr Goyal showed regenerated joint at 10 years of follow up. The lady is doing all her normal activities pain-free. Dr Goyal in his talk stressed members to take a pledge that they will advocate joint preservation options to their patient whenever there is a correct indication. Joint preservation surgeries are not easy surgeries; as these surgeries demand more time, more skill, more technology and more patience. A correctly done joint preservation surgery in a correct indication can give natural joint back to patients. 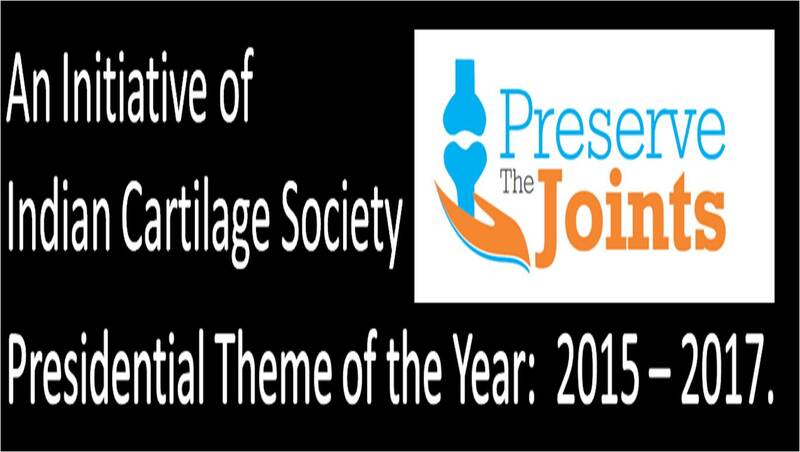 Lastly he made the “Preserve The Joints” logo public.